Coronary artery anomalies are rare entities. All angiographers and cardiac surgeons need to be familiar with these anatomic variants for proper surgical revasularisation in the presence of coronary artery disease. We report here an interesting case of superdominant right coronary artery with double posterior descending artery. Coronary artery anomalies are rare entities; overall incidence being 0.6-1.3%. Common congenital anomaly of coronary vessels, include origin of left circumflex artery from the right sinus of valsalva, origin of left coronary artery from pulmonary artery, presence of a single coronary artery, hypoplastic coronary vessels, coronary artery aneurysms, and coronary artery fistula. We report here an interesting case of superdominant right coronary artery (RCA) with double posterior descending artery (PDA). A 32-year-old premenopausal female presented in emergency department with retrosternal chest pain since 2 months. The pain was sharp or pressure like in nature, sometimes precipitated by effort, but often occurred at rest. On physical examination, blood pressure was 110/70 mmHg, pulse 82/min, respiratory rate 14/min, and temperature 98.4°F. There was pallor but no cyanosis, clubbing. icterus, or lymphadenopathy jugular venous pressure was normal. Chest skiagram showed normal sized cardiac shadow and pulmonary vasculature. Electrocardiogram revealed nonspecific ST-T changes. Cardiac enzymes levels and two-dimensional (2D) echocardiogram were within normal limits. A treadmill exercise test to evaluate inducible ischemia and functional capacity was prematurely terminated at stage 2 because of exhaustion and dyspnea. 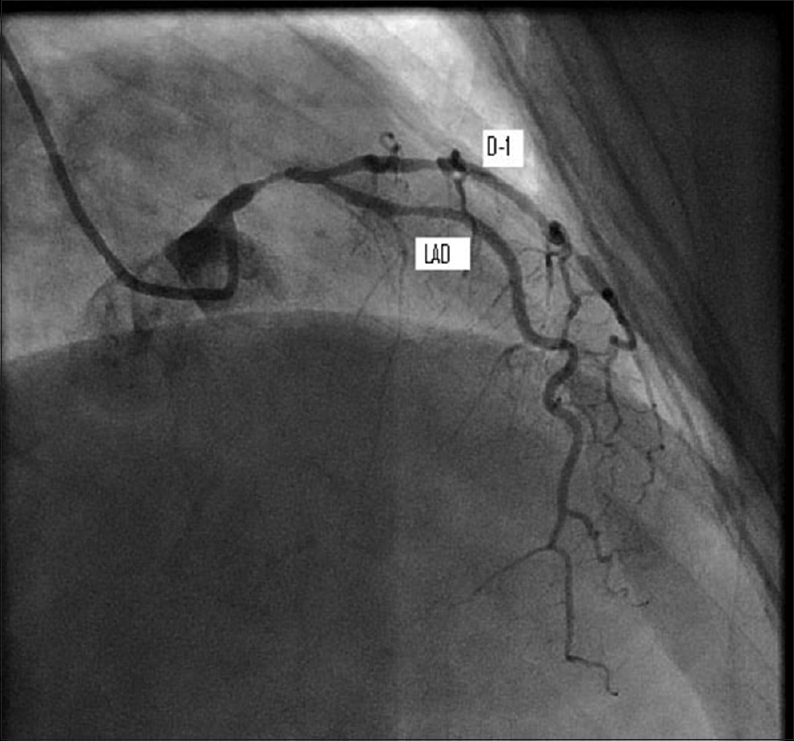 Diagnostic coronary angiography was therefore undertaken which revealed a normal left anterior descending (LAD) artery, but left circumflex artery could not be visualized [Figure 1]. 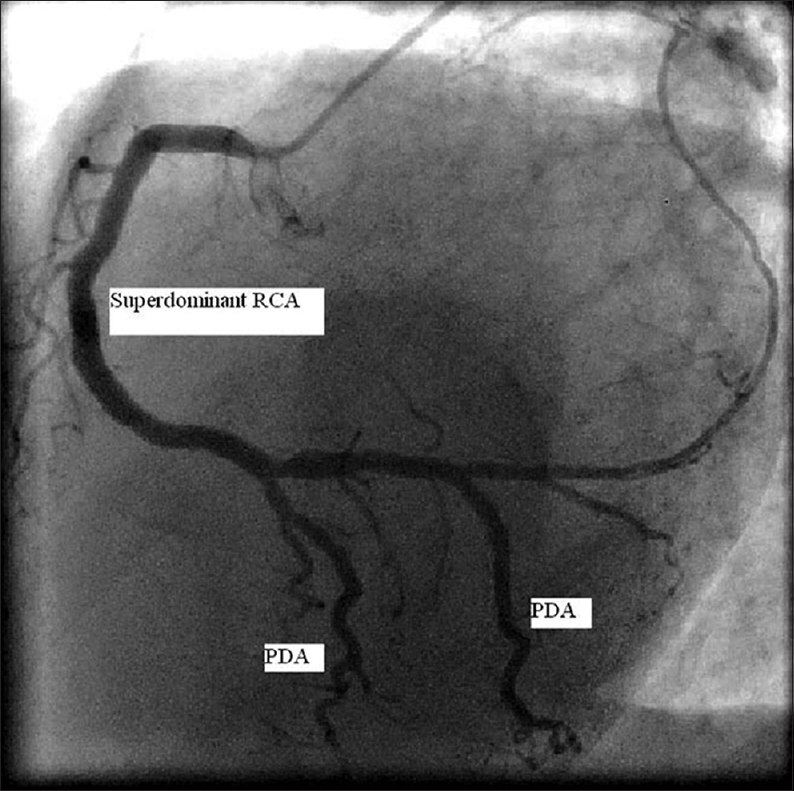 Upon selective right coronary angiography, a superdominant RCA with double PDA was noted. The RCA crossed the crux of heart and ascended along the entire length of the left atrioventricular groove, between left atrium and left ventricle (LV), perfusing the posterior and lateral walls of the LV. Two parallel PDA branches was an additional characteristic feature [Figure 2]. Isolated superdominant RCA has been reported in the literature. ,,, Ilia et al.,  had described a case of superdominant RCA with large tortous right posterolateral ventricular branch to supply the posterolateral nad lateral wall of the heart which is usually supplied by the left circumflex artery. Kumar  had also described anomalous superdominant RCA, which bifurcated into the superior and inferior right circumflex arteries to supply the territory supplied by an absent left circumflex artery. In our case it was double posterior descending arteries arising from a superdominant RCA, which supplied the territories usually supplied by left circumflex artery. Such combination of superdominant RCA with double PDA has not been reported yet in the literature. All angiographers and cardiac surgeons need to be familiar with these anatomic variants because accurate identification and delineation of the course and distribution of coronary vessels with nature of blood supply to the myocardium is integral for proper surgical revasularization in the presence of coronary artery disease. Doven O, Yurtdas M, Cicek D, Ozcan IT. Congenital absence of left circumflex coronary artery with superdominant right coronary artery. Anadolu Kardiyol Derg 2006;6:208-9. Mittal SR, Maheshwari M. Absent of left circumflex and unusual dominant right coronary artery. J Assoc Physicians India 2008;56:711. Vijayvergiya R, Kumar Jaswal R. Anomalous left anterior descending, absent circumflex and unusual dominant course of right coronary artery: A case report-R1. Int J Cardiol 2005;22:147-8. Namboodiri N, Harikrishnan S, Tharakan JA. Single coronary artery from right aortic sinus with septal course of left anterior descending artery and left circumflex artery as continuation of right coronary artery: A hitherto unreported coronary anomaly. J Invasive Cardiol 2007;19:E102-3. Ilia R, Jafari J, Weinstein JM, Battler A. Absent left circumflex coronary artery. Catheter Cardiovasc Diagn 1994;32:349-50. Kumar K. Anomalous course and branches of human coronary arteries. Acta Anat 1989;136:315-8.